Please indicate your fabric choice in the “Special Instructions” field on the checkout page. 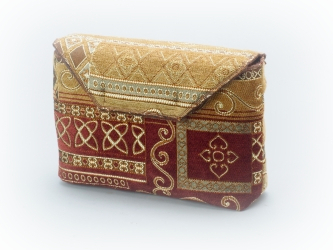 Our Book Charkha Bags are a beautiful way to protect that cherry finish on your charkha! Tuck into your spinning tote, and away you go! Made of upholstery-weight plush and woven tapestry-style fabrics chosen for strength and durability. Fully lined to protect your Bosworth Book Charkha. Spot wash. Dry cleaning recommended. 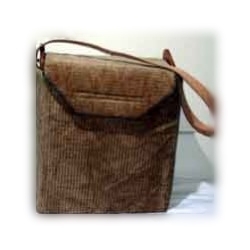 Our Attache Charkha Tote has a shoulder carry strap and a velcro closure. Made with upholstery-weight fabrics and lined for strength and durability and padded for protection of your charkha. Enter your name, email and message to have us send you fabric choices for Journey Wheel Totes. Protect your Journey Wheel’s beautiful cherry case with this easy to use Journey Wheel Tote. 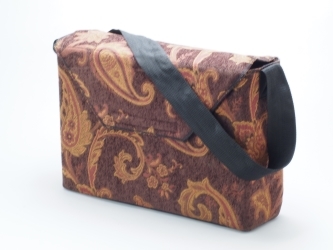 Your Journey Wheel easily fits in the fully-lined upholstery-weight plush bag made for strength and durability. The top flap folds over and shuts with a velcro closure.